Windows 7: "Device in Use" No Sound From Speakers. "Device in Use" No Sound From Speakers. What programs, that may use audio, do you have running? What is in the Notification area (lower right) such as Skype, etc? Recycle the sound device. If there are any Windows corruptions this will fix it. Go to the Device Manager, RIGHT click on the IDT sound entry and then LEFT click "Uninstall". DO NOT uninstall the driver. Restart the PC and when Windows starts it will detect and reinstall the IDT sound. Look at the Task Manager, may find the program that is causing it listed. I have had this problem on a Dell Latitude, and I finally found a solution that worked for me. In the Control Panel, in Hardware and Sound, there is an IDT Audio Control Panel. In that panel, I unchecked "Enable Power Management." I rebooted and the problem disappeared and has not returned. Thank you VERY much for posting this! Your fix has resolved quite a frustrating ongoing random issue for us. Thank you! No sound "Audio Output Device not Installed". 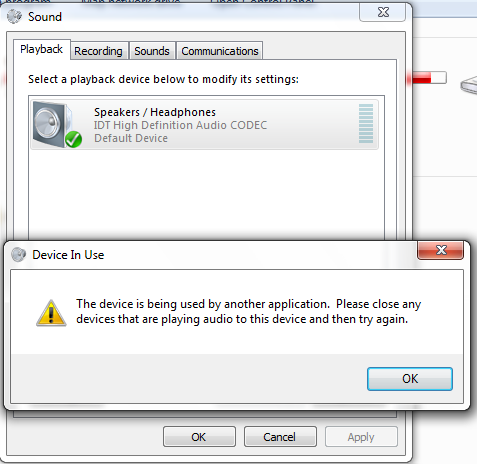 Sound error "no audio output device is installed"
Speakers only produce sound when "Front"